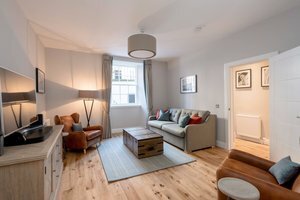 Beautiful luxury apartment in Edinburgh. Contemporary garden flat in the city’s West End. 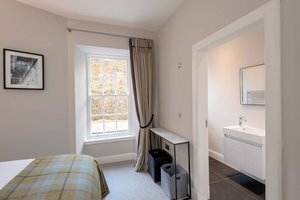 Stay in this 2 bedroom holiday rental property in Edinburgh that sleeps 4 (+2) with Wifi, Bath towels, Linen included. 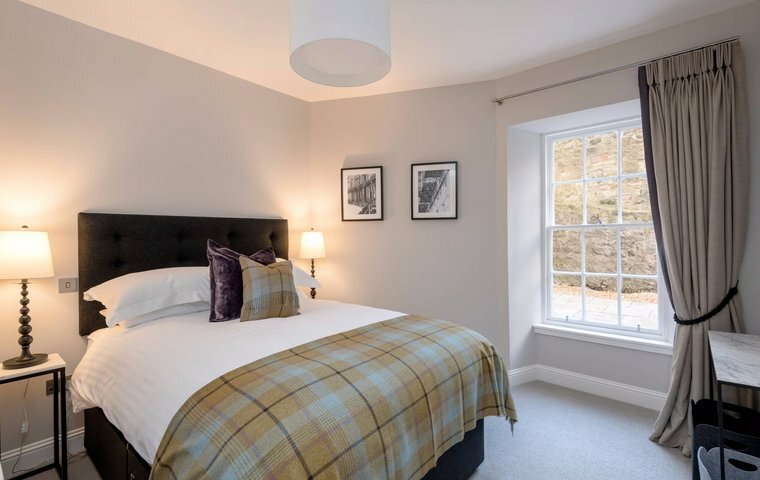 This beautiful 2-bedroom garden flat is the perfect luxury apartment in Edinburgh. 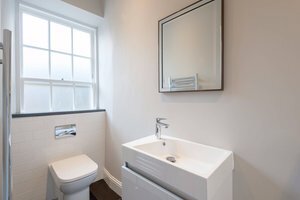 Located in the vibrant West End of the city, it has recently been refurbished and stylishly decorated. 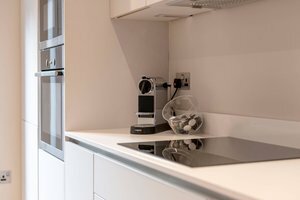 The apartment has a contemporary and luxurious feel. It’s fresh and filled with light. 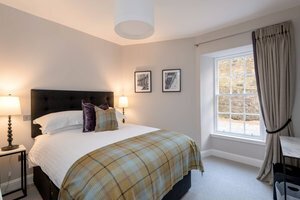 And there are comfortable soft furnishings, contemporary artworks and modern touches. 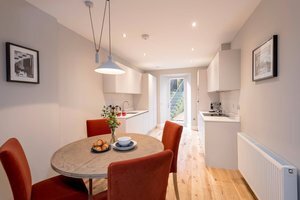 A real home-from-home in the centre of Edinburgh, with added luxuries such as a Sonos system and Nespresso machine. 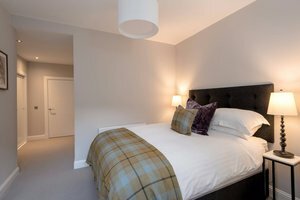 This luxury apartment in Edinburgh has 1 king room, 1 double room and a sofa bed in the lounge. So, it would be perfect for families and groups of 4 to 6 people. 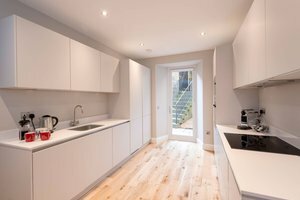 A luxury apartment on Stafford Street in Edinburgh’s West End. 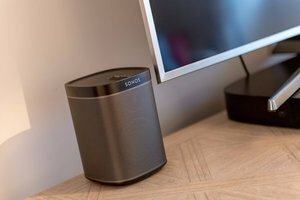 The stylish lounge offers plenty of comfortable seating, a widescreen TV and sonos system. A fully equipped kitchen dining room is off the lounge, and has doors out to the courtyard. This private outdoor space is a real find in a city centre flat. There are two bedrooms. A double bedroom to the front of the property, and a larger king bedroom with ensuite shower room to the rear. 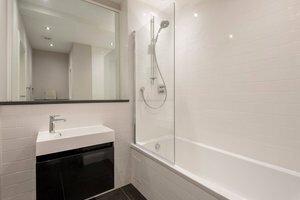 In addition to the ensuite, there is a main bathroom off the hall with bath and shower overhead. 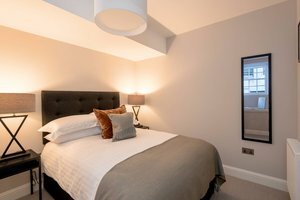 This luxury apartment in Edinburgh is located in the West End of the city centre. You can easily get there by tram from Edinburgh Airport, getting off at West End Princes Street stop. Or, by any bus or train going to Haymarket. Parking notes As this is a city centre property, parking is restricted to roadside paid meter Monday to Saturday, with a maximum stay of 4 hours between 8.30am and 6.30pm. Or, the longstay NCP Car Park on Castle Terrace us just a 5 to 10 minute walk away. Local area Stafford Street is in the stylish West End of Edinburgh. Both Stafford Street and the popular neighbouring William Street provide wonderful independent shops, boutiques, cafes, bars and restaurants. 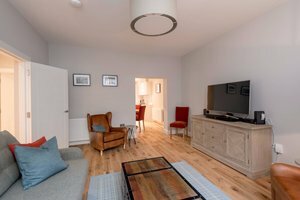 It is incredibly central and just minutes' walk to Edinburgh's main shopping streets, Princes Street and George Street, and a further 15 minutes walk to the Royal Mile and Edinburgh Castle. You can easily access trains, trams and buses too. So, this is an ideal location for those wishing to walk or use public transport. Very helpful , friendly and keen to make sure your experience is a very positive one. This is an excellent apartment - very modern , well furnished and decorated - all very tasteful , spacious and very comfortable . 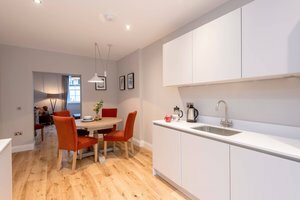 It is in an excellent location - easy to walk everywhere to the centre and all that you require.